On the 31st of October the Oasis of the Seas passed under the Great Belt Bridge as it sailed for the first time out of its birth waters of the Baltic and into the North Sea. At 360 metres long, 64 metres wide and 65 metres high it is the 40% larger than any other cruise ship. This extraordinary vessel can accommodate over 6,000 guests, supported by over 2,000 crew. Amongst its many superlatives it has 24 elevators, a beach pool, a Broadway show and a bar that moves slowly up and down by 3 decks. But what really attracted me to the story of the Oasis of the Seas was none of this glitz, but how it got under that bridge. 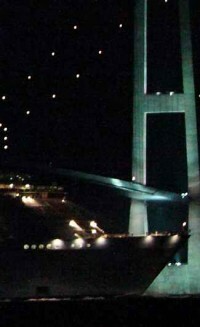 At midnight, taking advantage of the lowest possible tide, the ship snuck under the middle arch of the bridge. Despite the fact that it had lowered its retractable funnels, that might not have been enough, so it had to approach at an accelerated speed so that the hull bit into the water making it lower still. Even so it cleared the bridge by less than 60cm. That is an astoundingly small margin of error for such a mammoth: 0.009%. The day after this was reported in the UK news, another engineering task with a very different outcome was reported. This concerned a UK government IT project that was intended to track offenders through the criminal justice system called C-NOMIS. This project has been the subject of an enquiry by the Public Accounts Committee (PAC). The PAC is appointed by the House of Commons to ensure that public money is spent with economy, effectiveness and efficiency. The C-NOMIS project started in 2004 with a budget of £234m. By mid 2007 it was already two years behind schedule and estimated costs had tripled. “There was also poor planning, poor financial monitoring, inadequate supplier management and too little control over changes.” The PAC report states. It continues: “Costs and progress were not monitored or reported for the first 3 years after the inception of C-NOMIS … [they] cannot say in detail what £161 million to October 2007 was spent on.” It was later abandoned. Sadly, many software product development projects that I have been involved with have been far more like C-NOMIS than the Oasis of the Seas. I don’t know whether the Oasis’s project was on time and budget, but just having the balls to shoot it under that bridge with such a small margin of error suggests that they were supremely confident of what they were doing. If an experienced software development manager had been on the Oasis project he would have suggested adding the last couple of decks onto Oasis once it had got through the bridge “just in case”. I know that specifications for software products often change; I know that the technology often includes invention, and I know that unforeseen problems catch us out, and that is why we have developed agile methods in order to be responsive. But, I stand in awe of an engineer who can see his 225,282ton, 600,000bhp, $1.3bn ship sail at speed at a bridge knowing that he has just 0.009% clearance. We could do with just a little of that level of engineering in software development and IT projects. This entry was posted in create and tagged development, management, tech, technology portfolio. Bookmark the permalink.